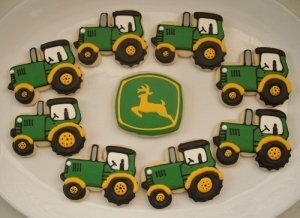 Although John Deere has been around for a while, John Deere party favors are new hit on the popular party favors list. If your little one likes farming, especially the tractors, a John Deere party might be just the thing! Don't think it's just the boys who love a good tractor party! John Deere offers plenty of girly (think pink!) party supplies and favors! Tractor Pull! - John Deere has its own line of play tractors. Buy miniatures (1 per guest). Tie a shiny, yellow ribbon around the tractor with a "thank you" tag attached. Give them out during the party when the little farmers are getting restless. Have a tractor racing contest to add to the party fun! Farm Supplies - Buy John Deere caps (in pink and/or green for girls and/or boys). Turn them over and include any of the following items - packets of vegetable seeds for planting, a plastic spade or mini-pitchfork, John Deere stickers/tattoos, a bandanna, little farm animals (Little People has a great variety or check out the dollar bin at Walmart or Target), plastic tractor toys, candies shaped like fruits. Would you like to buy either pre-packaged favors or favor items in a John Deere theme? Celebrate Express takes the guesswork out for you! Includes John Deere Pink empty favor box*, John Deere Pink sticker sheet*, notepad* and box of 4 crayons, horse bean bag, an asst. rubber flower ring, and (2) jelly bracelets asst. Please Note: One or more of the party favors included in this favor kit may be substituted with an item of similar quality due to availability. This is an officially licensed John Deere product. "Each box includes a John Deere notepad*, a John Deere blowout*, a John Deere sticker sheet*, a 5"" plush cow, corn squirter, and crayons. Easy assembly. One or more of the party favors included in this favor kit may be substituted with an item of similar quality due to availability. 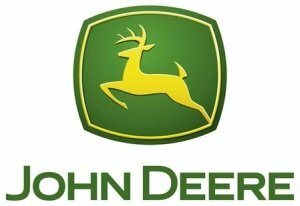 *This item is an officially licensed John Deere product." Back to Kids Birthday Party Favors. Return from John Deere Party Favors to Home. John Deere Pink Empty Favor Boxes for your little girl farmer! John Deere Ultimate Party Pack for all your party needs! John Deere Empty Favor Boxes for boy or girl! Hat - John Deere for favor holders. John Deere Tumbler kids cups for the party or favors. John Deere Pink Trucker Hats (8) set for the party-goers or favor holders. 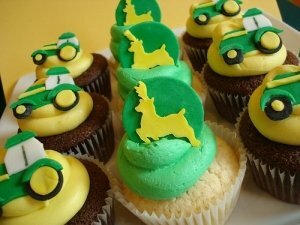 John Deere Cake Toppers for your tractor field cake!